Technology has made many things in our lives easier, but there's no denying that it's complicated certain things, too. Take etiquette for example, which has become increasingly difficult to navigate in this age of smartphones and social networks. And in a socially complicated situation like a wedding, figuring out when exactly it's polite to use your smartphone or snap a picture becomes even more complicated. So what tech rules should you follow to be a good wedding guest—and not upset the happy couple's big day? 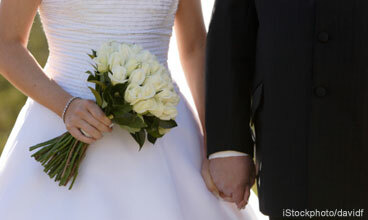 We have 5 guidelines to follow for wedding success. Depending on the couple, their opinions on sharing photos and other updates on the Internet will vary. Some couples may prefer to keep their ceremony private—and offline. Others might encourage sharing and even recommend a hashtag to use or specific social networks to post on in order to make it easier for everyone interact and share memories. But even the more socially-minded couples may not want you sharing certain things—like the bride's dress before the ceremony begins. The key to being polite here is to make sure you know the couple's wishes before you make any posts—look for anything in the invitation or other wedding info you've been given that tells you what or where to share. And if you aren't sure? Don't post any photos at all (especially of the bachelor/bachelorette party!) And if you have any particularly nice shots, you can always pass them on to the couple privately. For better or worse, having a smartphone makes all of us photographers and videographers, stalking around with our phones in-hand, ready to capture the perfect moment. But if you're taking pictures—with your cell phone or not—be sure you're being polite about it. Snap photos or catch videos to help remember the event and, if the couple allows it, share with friends. Be sure you aren't blocking anyone's view when you're trying to snap photos. Be careful using the flash, which can be disruptive if you're constantly snapping candids. Follow the bride and groom—or anyone else—around like a paparazzi trying to catch the perfect shot. Take photos with your tablet, which is guaranteed to block someone's view. Also be aware that there may be times during which the couple won't want you taking pictures at all—like during the ceremony. 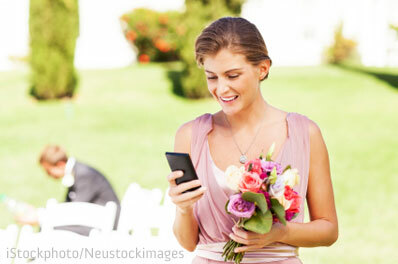 Remember: you're here to enjoy the wedding, not be glued to your smartphone or camera. If the couple asks you not to take photos at any time, be sure to respect their wishes. 3. Pay attention to the ceremony, not your smartphone! On that note, remember to pay attention to the ceremony and the people around you rather than your smartphone. Yes, we live in a connected world and most people will understand if you break away from the social situation to check out what's on Facebook or Twitter. But don't stay glued to your phone throughout the wedding—and definitely put it away during the ceremony. Trust us: you do not want to be the person whose phone rings in the middle of the ceremony. Not only is it terribly embarrassing for you, it's sure to upset the everyone there. To avoid getting the cold shoulder from everyone, you should silence your phone and any other gadgets you're carrying on you. Or, better yet, you can turn them off entirely: this means no chance of accidentally leaving your ringer on or the noise of it vibrating disturbing anyone nearby. The cardinal rule of etiquette really comes down to just being nice to others. And this goes double when you're posting to social networks. Make sure you consider how what you're posting will look to others and whether it might upset anyone. There's a good chance you'll catch an unflattering or inappropriate photo or two as the evening progresses, and no one's going to want to wake up the next morning to find embarrassing photos online. This rule goes for comments, too: be polite, and if you can't be polite, be quiet. If you want to keep your friends as your friends, be sure to think before you post, and skip posting anything rude or embarrassing. No matter how funny you may find it, the laugh isn't worth upsetting your friends. These rules aren't especially different from the everyday etiquette of social media—and so they shouldn't be too hard to remember and follow. However, at a wedding—which is supposed the event of a lifetime for the happy couple—you should be especially careful to practice social media manners. Because, trust us, committing a social faux pas at a wedding can get remembered—and not in a good way—for a long time. Having trouble remembering what to do? Then we can pare the list own to a single rule: keep your phone silent and in your pocket! And now that we've gotten that covered, be sure to enjoy the wedding! Turning of your tech during a wedding is such a good thing to do. Nobody wants to hear your ringtone go off in the middle of the vows. Also, as mentioned above, even having the noise off is terrible because the noise of the vibration can be annoying as well.